Roof Services provides the most comprehensive installation, repair, maintenance and consulting for all major roof systems and designs. In business since 1985, our goal is to meet your roofing needs with the highest quality in customer service and support with 100% satisfaction guaranteed for all installations and repairs. To better serve you, Roof Services has four distinct divisions with dedicated, professional personnel. Because each department is run as a separate unit, you can be assured—from ordering materials, through preparation, installation and service—you’ll receive the professional and personal attention your should expect from our experienced staff—right down to the finest detail. Residential Roofing & Siding Division – We’ll help you choose the best materials to fit your home and budget. We install residential roofing and siding from Montauk to the 5 Boroughs. Commercial Roofing Division – Commercial Roofing and Waterproofing is a major investment. Our team is ready to help you choose the right system and materials so your company will gain the greatest life expectancy from your investment. 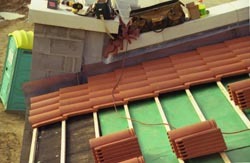 We install commercial roofing for all of Long Island, New York City, Northern New Jersey and Westchester. Repairs & Maintenance Division – Our Dedicated Repair Team services both Residential and Commercial roofs– No repair job too small or too large, our repair team is always ready! Our repair and maintenance team travels throughout Long Island, New York City, Northern New Jersey and Westchester. Roof Consulting Division – Does your Commercial building need roof repair or replacing? We’ll perform an accurate evaluation then make recommendations to show you the best options for repairs, new roof systems, materials, procedures and specifications—to make your decisions much easier. Call us for your roof consulting needs anywhere in the Tri-State Area. Getting started is easy. Call us today for a free, no obligation consultation. Roof Services is the premier roofing and siding specialist—Where Concern is Over Head.